Celestial views await you at Angel Haven in the Sherwood Forest community. With its incredible mountain scenery and top-of-the-line amenities, this cabin rental will please every member of your family. 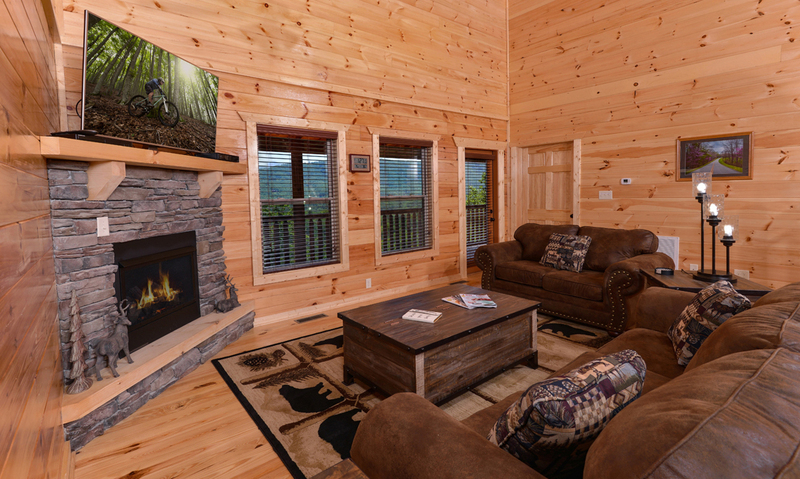 Enjoy your own indoor pool, an incredible game room, a theater room, and bunk beds in this fantastic 3-bedroom cabin in the Smokies. 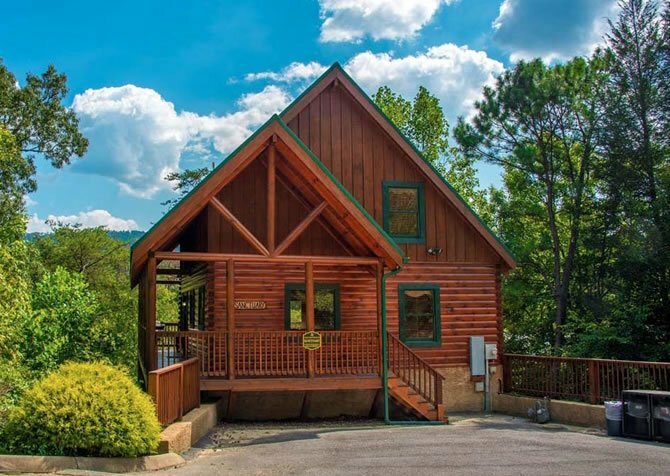 Whether you are looking for a peaceful getaway, a fun-filled vacation, or simply a perfect place to make memories with your favorite people, Angel Haven has it all! 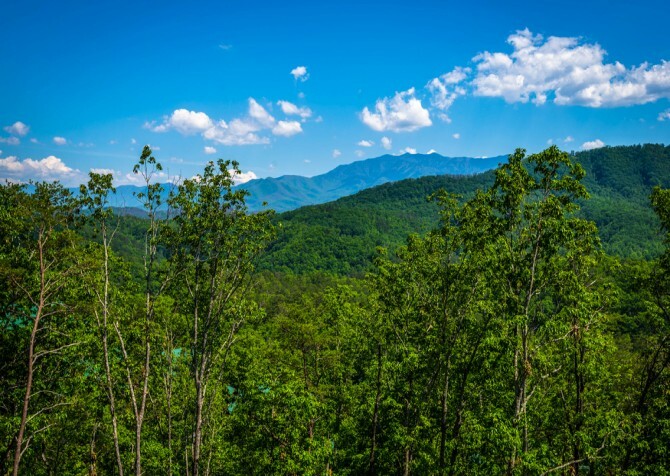 A trip to the Smoky Mountains is enjoyable no matter the time of year, but it’s true that the fall season is a favorite. 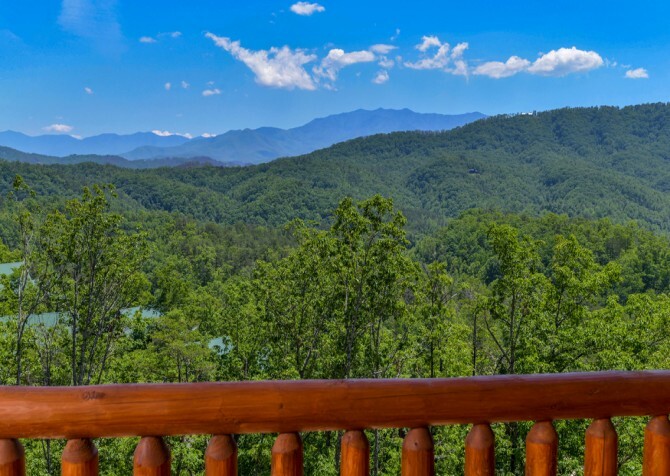 Here at Angel Haven, you will enjoy incredible views of the rolling hills and, yes, the “smoky” mountain mornings from almost every space, as well as a perfect view of the changing leaves as the Smoky Mountains show off their many colors. 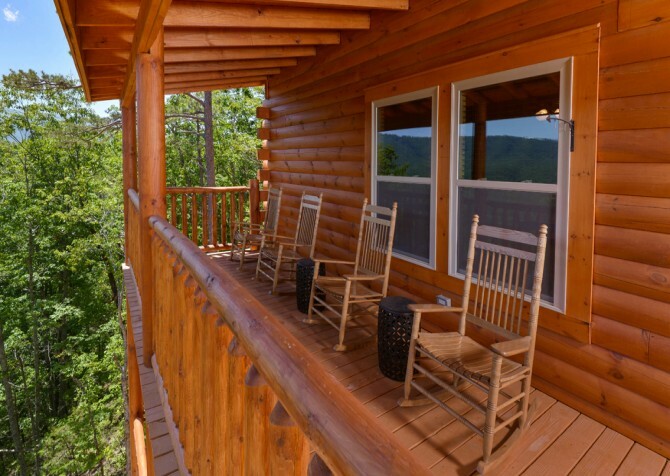 Whether you are soaking in the hot tub or rocking in one of the four rocking chairs, you will be astounded at the incredible views from this cabin. This modern-mountain living room is equally stylish and comfortable, with plush leather seating, a lovely stone fireplace, and a 55-inch 4K super-ultra, high-def smart TV with HDR and a 4K high-def upscaling Blu-ray player – with premium cable TV service - that impresses. 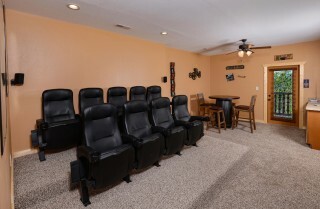 Whether it's game day or a rainy day, it's the perfect place to settle in with drinks, snacks, and family and friends. 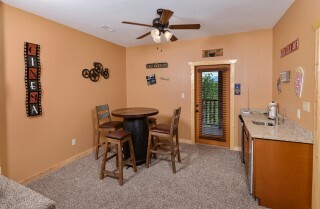 And because it’s open to the kitchen, you can enjoy hanging out with your family even while you are in separate areas. 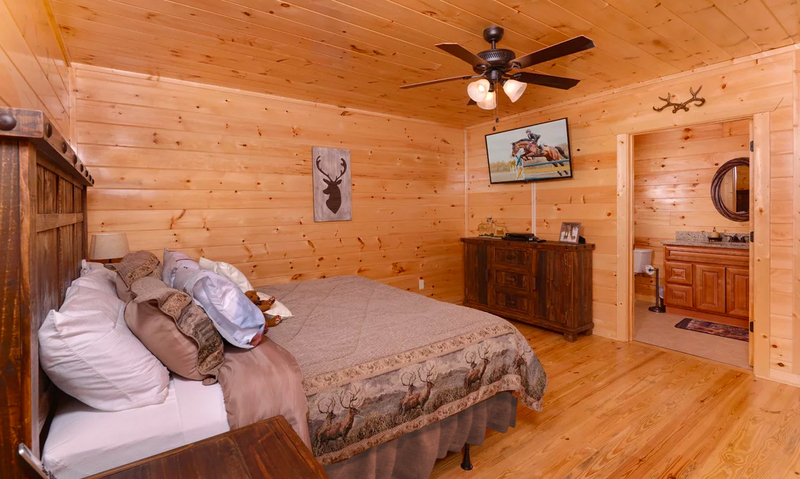 The soaring ceilings, beautiful warm wood interior, and abundance of windows will make this cabin the perfect setting for memories with your family and friends. 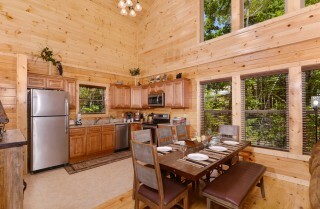 Choosing to rent with Cabins for YOU means you will enjoy a fully equipped kitchen during your stay in Pigeon Forge. The cabin is equipped with dinnerware, glassware, and utensils for 16 if you have a couple extra people joining you for dinner! While there are so many great unique eateries not far from your cabin—like The Old Mill and The Apple Barn, not to mention those at The Island—when you would prefer to save money or just stay in and enjoy the views, you can do just that. 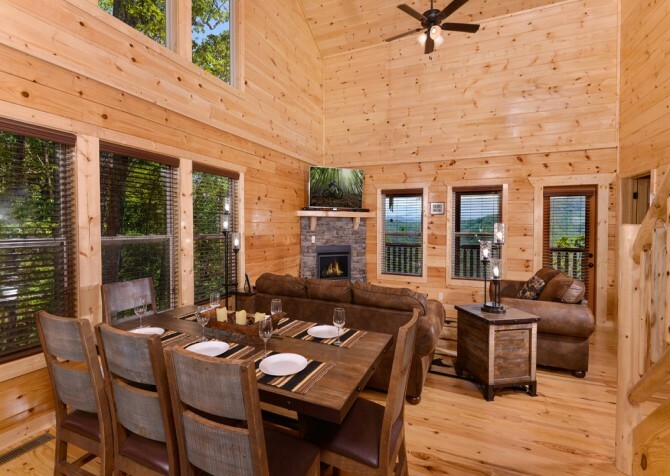 Cook a delicious pancake breakfast, gather items for a hamburger picnic, or get together and make a memorable hearty steak and potato meal to enjoy together at the dining table. 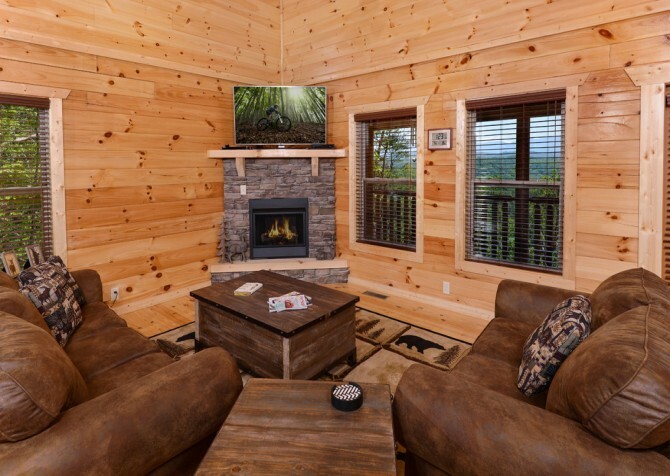 You’re sure to create lasting memories! 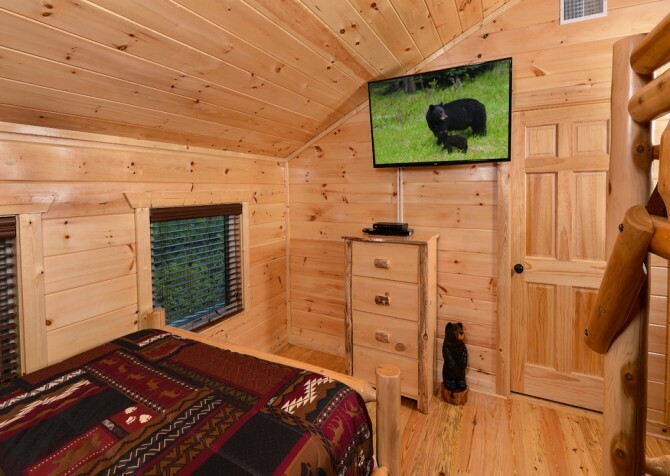 If you want to go the extra mile, browse our in-cabin specials and have a special something waiting in the refrigerator for your arrival! 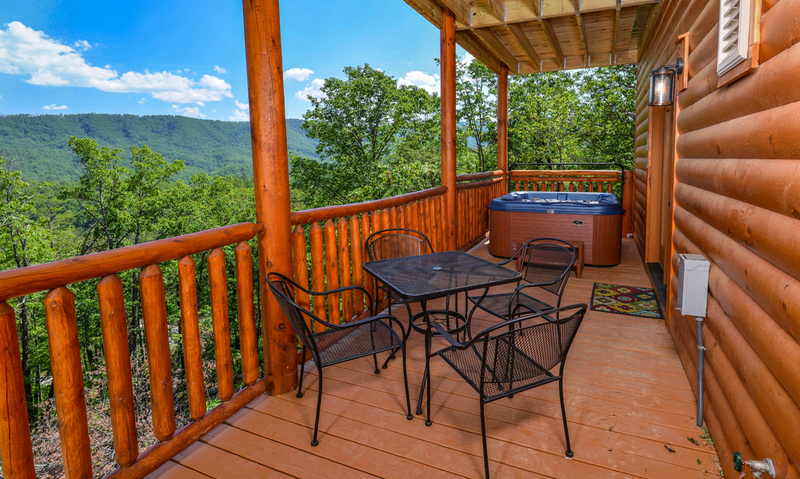 The Mountain Breakfast package is a great way to start the day. Arrive at your cabin rental and enjoy a leisurely evening enjoying all the amenities, knowing you’ll wake up in the morning with a full hearty breakfast waiting to be whipped up. 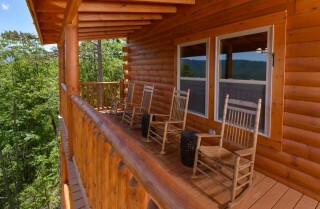 There is nothing better than the smell of bacon, eggs, and pancakes cooking in a cabin! 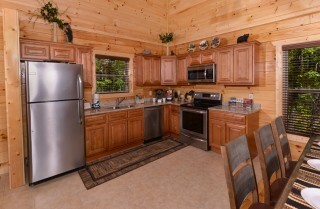 And don’t forget about your fresh cup of coffee in the morning, brewed from your Keurig K525 coffeemaker. 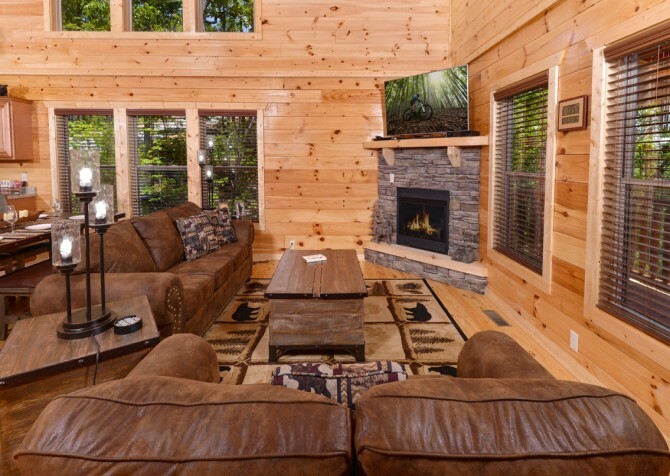 Make the most of your time at Angel Haven by taking advantage of all the amenities, including the large 8-person dining table with padded bench. And if that’s not enough room, your guests or family can spill over into the living room and enjoy their meal while kicking back with the flatscreen TV and watching the game or a favorite show. 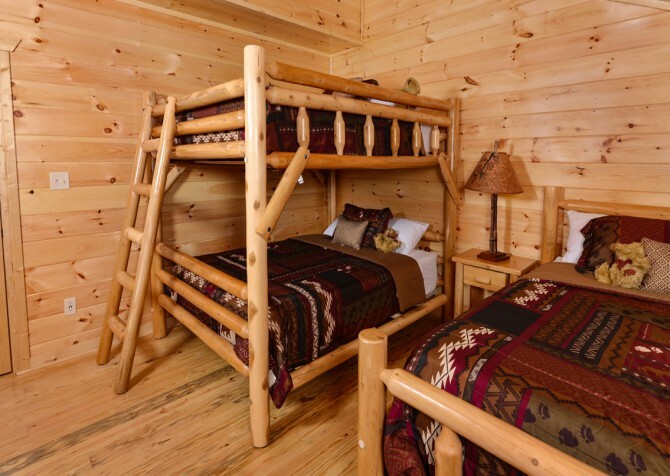 Guests at Angel Haven will enjoy 3 bedrooms: one with a king bed and tub/shower combo in the bathroom, one with a king bed and 5-foot shower with a seat in the bathroom, and one with a queen-over-queen bunk bed and a single queen-size bed with tub/shower combo in the bathroom. 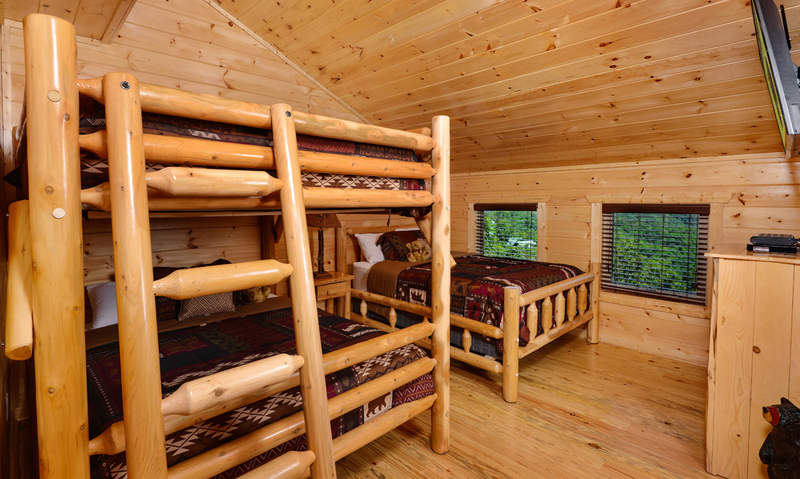 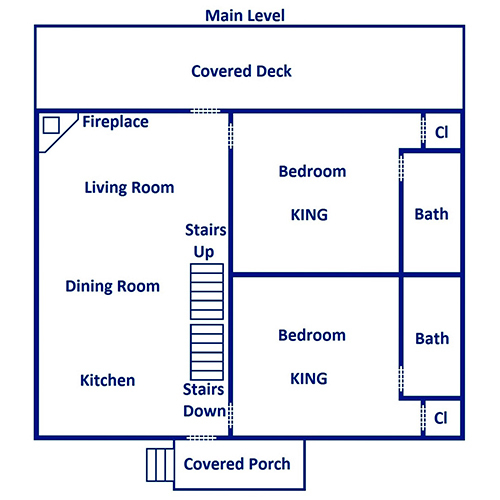 Each room has plenty of storage space. Cozy up in your pajamas when the day is through and enjoy a show or movie on the 4K flatscreen TV with Blu-ray player. 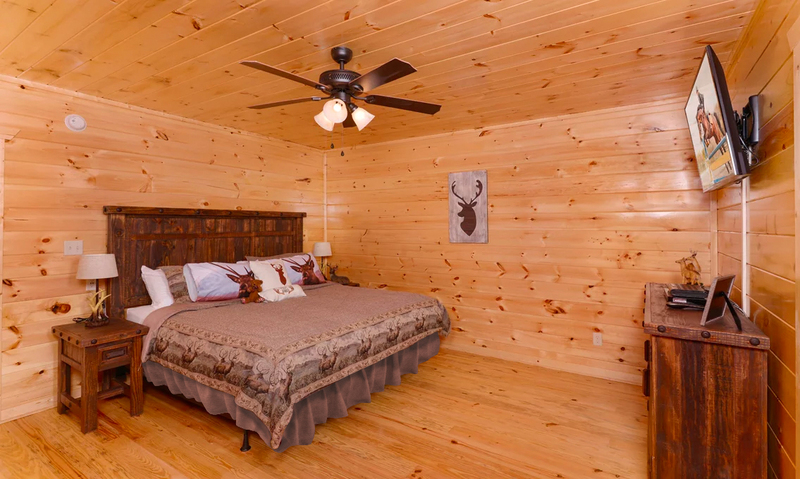 There’s one in every bedroom. 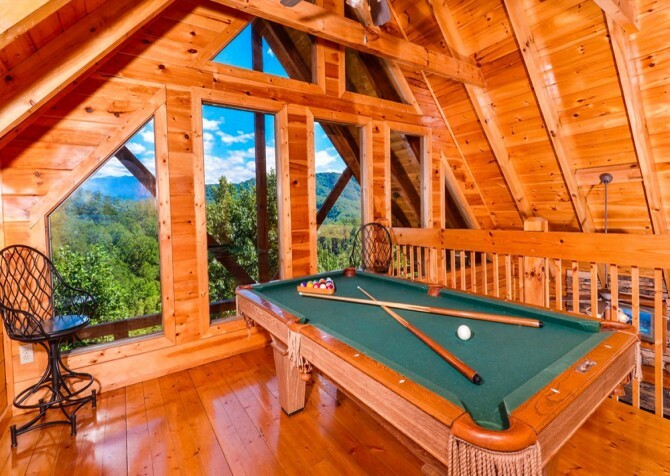 You’ll also find the view out many of these windows to be absolutely spectacular. 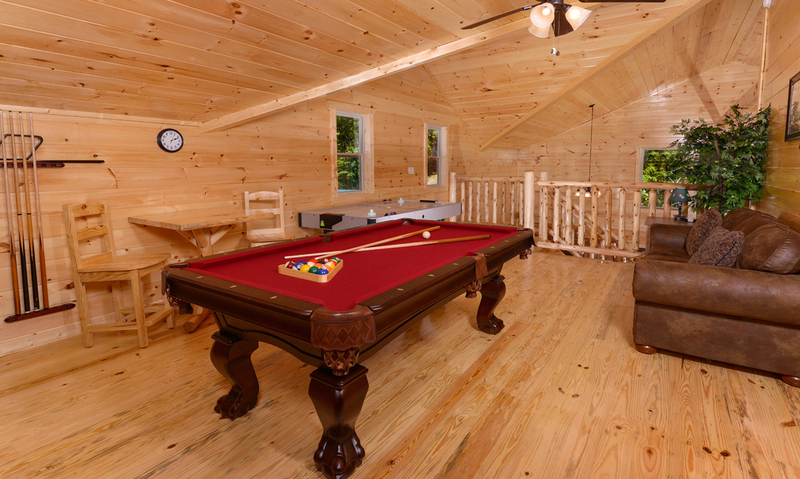 The cabin also offers more sleeping space, with 2 queen-size, commercial-grade sleeper sofas – one in the living room and one in the loft/game area. You can’t ask for more than what this top-of-the-line game room at Angel Haven offers. 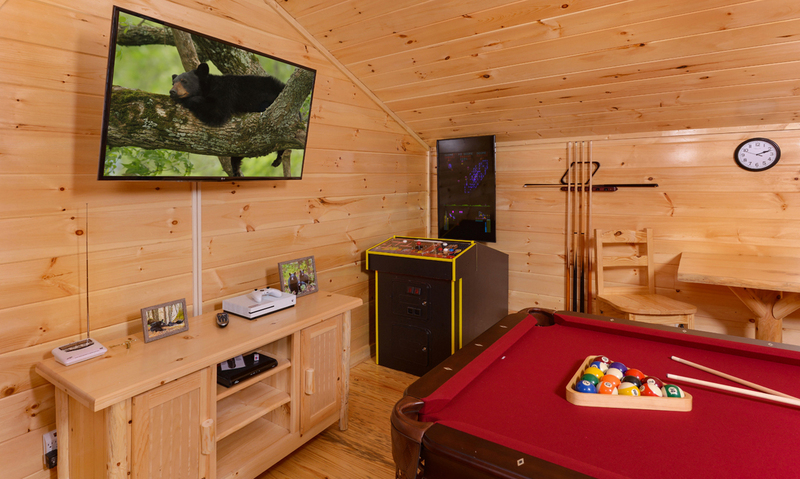 A pool table, air hockey table, game station, board game table, and 50-inch 4K ultra high-def smart TV with a 4K Xbox One S that can also play 4K ultra DVDs round out this perfect family fun room with lots of space. The hardest part will be choosing which game to play first! The game room overlooks the lower-level kitchen and living room so that everyone can be in on the fun. 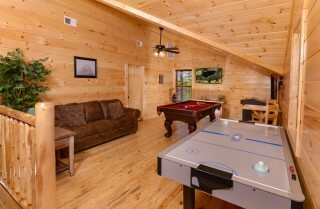 Let part of the group play pool while another team tackles air hockey, the younger ones enjoy game stations, and a couple others set out the checker board! With seating for 9 (plus room on the carpeted floor for the kids to camp out! ), this theater room will have you feeling like you’re at the movie theater – except you have it all to yourself. Each seat is leather and includes its own cup holder. The theater room features a 75-inch 4K super-ultra, high-def smart 3D TV home theater system with full 5.1 surround sound, plus a large selection of high-def Blu-ray 3D movies and 4K ultra-high-def Blu-ray movies. You’ll have seating for 4 at a pub table next to the wet bar. The wet bar is the perfect place to make drinks for movie night or hanging out, with a mini fridge and a Sonic-style icemaker! 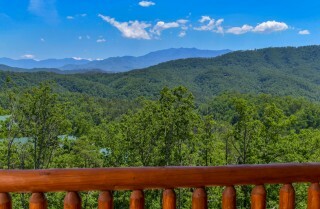 The deck can be accessed from this room, meaning you can step out at any time for an intermission to take in the fresh air and the wonders of the Smokies right outside your doorstep. 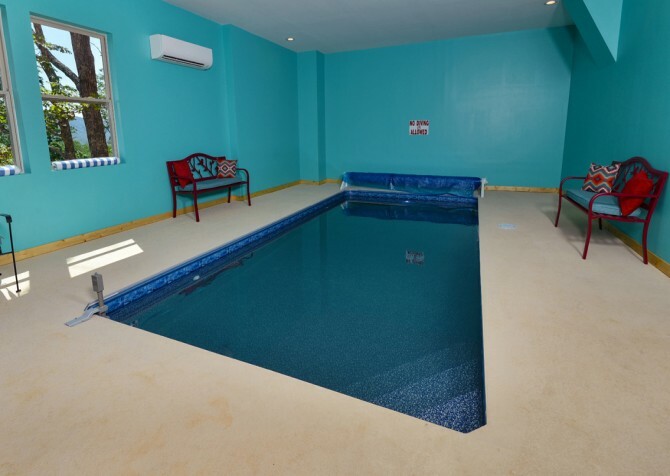 Kids and adults alike will delight in being able to take advantage of the indoor pool located in a bright room with fresh towels and plenty of seating. Take a morning, afternoon, or evening swim as you glance through the windows at the mountain scenery. It doesn’t get more luxurious than this! 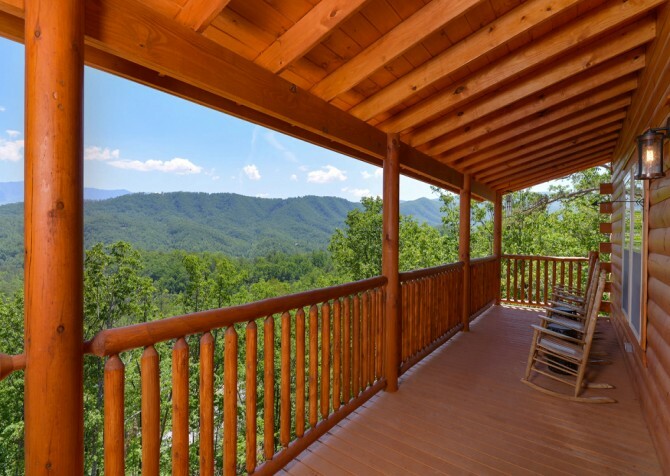 Step outside onto one of the two fantastic covered decks at Angel Haven. 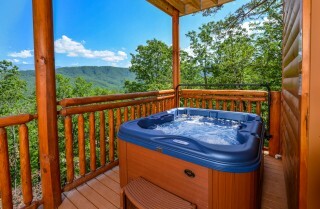 One includes a luxurious hot tub where you can relax at the end of a fun day and gaze at the stars above the Smokies. 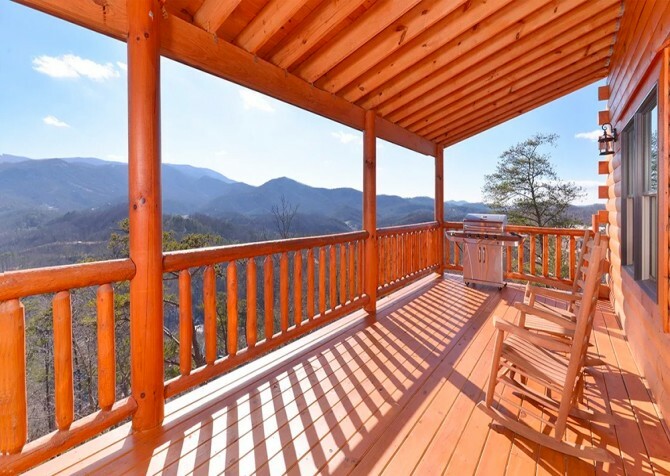 Or get away from it all and slip out to the second covered deck, where you can find 4 rocking chairs to while away the moments in the beauty of the hills around you. 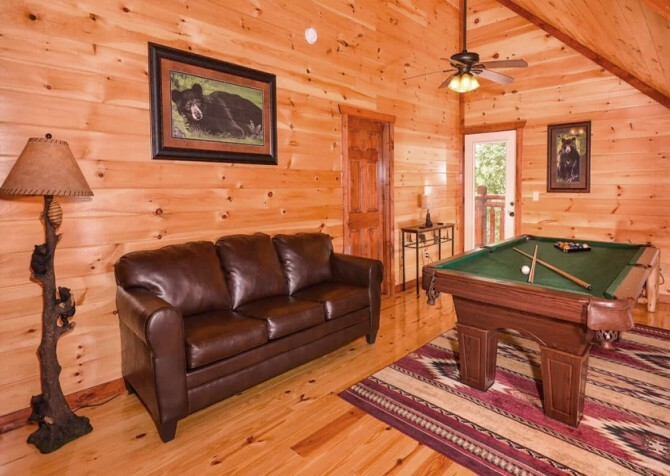 And don’t forget the burgers, kabobs, and steaks. 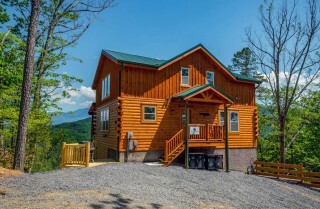 This cabin features a Weber Premium Natural Gas Grill 33K BTU for the ultimate cookout nights! Throughout the cabin, high-speed Wi-Fi lets you stay connected when you’re away. You can keep up with emails, check our blog to see what events are going on during your stay (or get area tips and tricks), or get online to buy your area attraction tickets ahead of time. If you take advantage of our Cabins for YOU Partner Program, you’ll save even more on area fun! 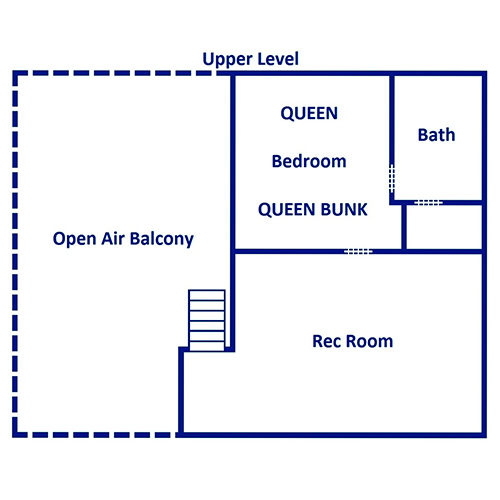 Another fun perk? Each room is equipped with USB charging plugs for your convenience! You can also stay on top of the weather with National Weather Service Weather Radios on each floor and keep laundry in check with the full-size washer and dryer in the cabin. Angel Haven has more than enough to keep you entertained, but be sure to venture out and see what else is nearby. We have a feeling you won’t be disappointed. 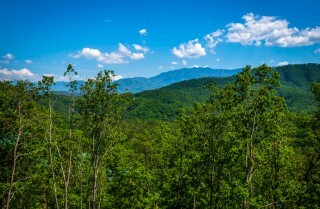 From Margaritaville and Paula Deen’s Family Kitchen to the Great Smoky Mountain Wheel and boutique shops, The Island in Pigeon Forge has something for everyone. 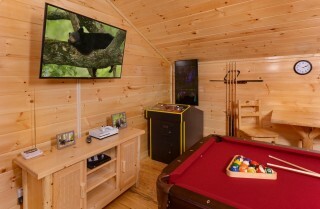 Kids will love the ropes course and arcade, and everyone can browse the unique stores! 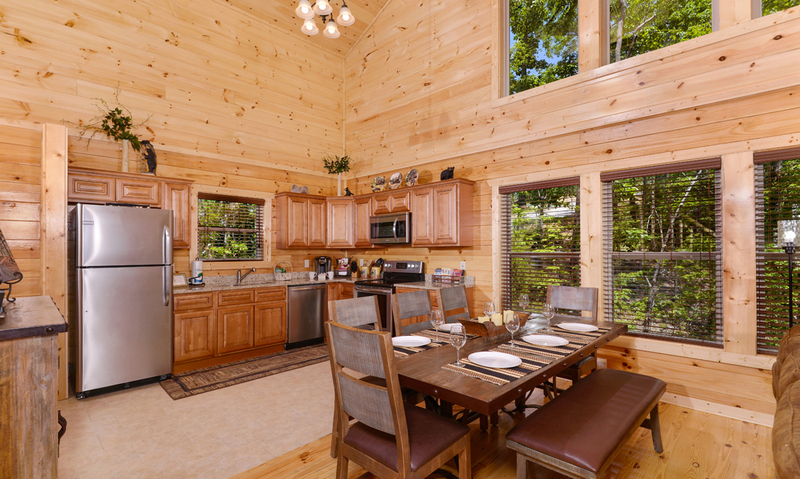 The Applewood Farmhouse Restaurant serves up Southern favorites year-round and is known for its fresh apple fritters and refreshing apple julep. Stop by for a hearty meal or grab some mixes to whip up in your cabin! 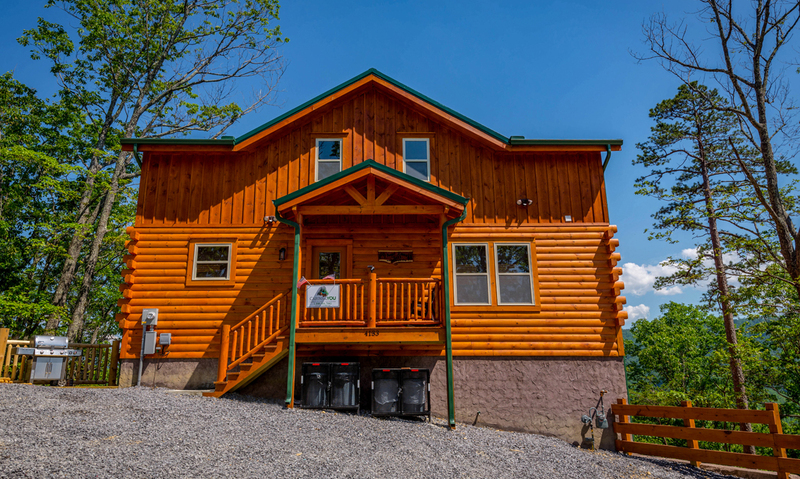 Shows at The Comedy Barn will have you slapping your knee and singing along, with comedians, animals, jugglers, country and gospel music, and more! Stop by for shows at 5 p.m. and 8 p.m. nightly. 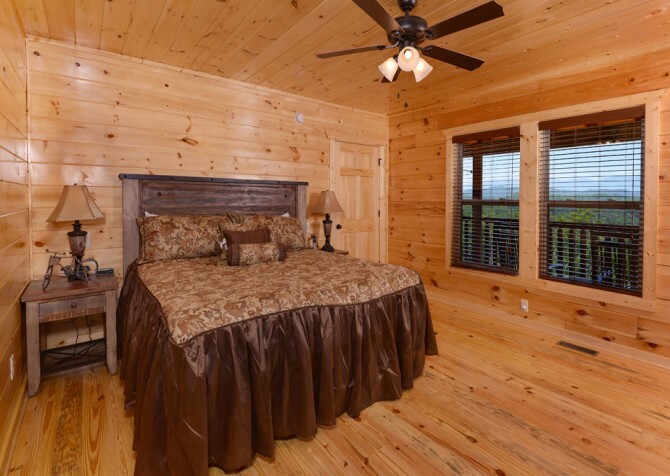 "I have stayed in multiple cabins through Cabins For You and things have always been great! Most recently, we stayed in Angel Haven and LOVED it. Their cabins are always clean and well decorated! I wouldn't book through anyone else!" "We chose Angel Haven because it was large enough to hold 12 women! We came in on a Friday and left on Monday for a bachelorette get away. It was absolutely perfect! 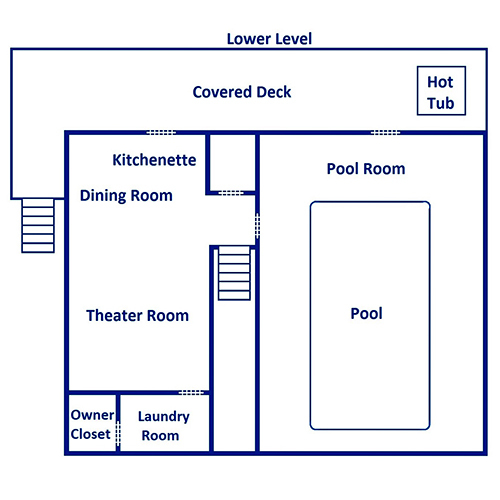 3 full baths, 3 huge bedrooms, media room, huge living room, and kitchen area. The owner was very easy to access and made our trip that much more memorable! 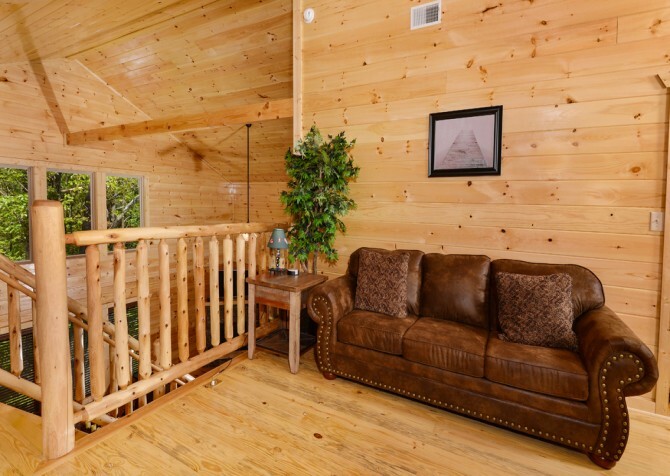 Definitely would recommend this cabin to anyone looking for a large group or large family cabin!" 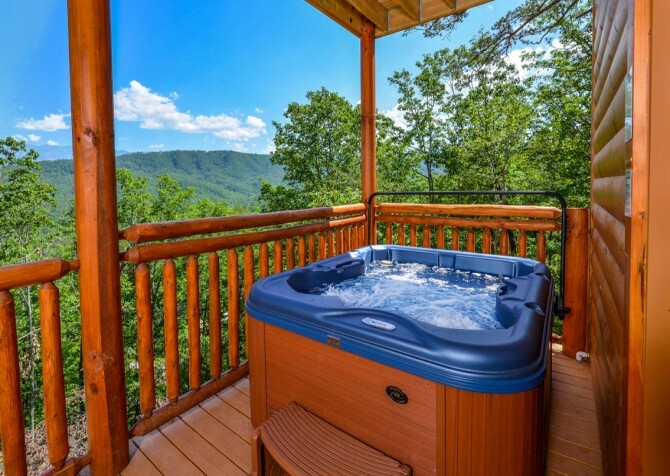 "Angel haven is beautiful, with awesome views and something for the whole family!" 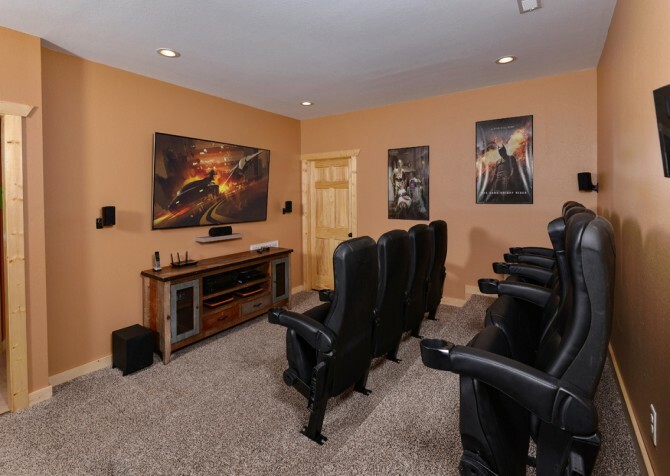 "Customer service was amazing. We had a few snags at the cabin (no fault to the owner or the cabins for you company ) and they were immediately fixed. The cabin was even better then described. 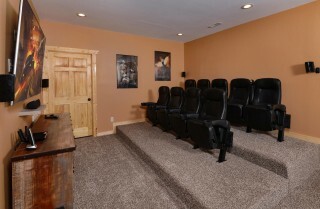 And worth every dollar we paid. 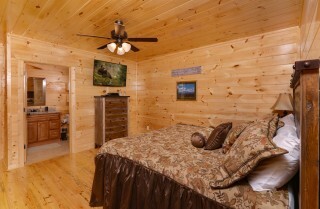 We WILL stay with cabins for you again"